These trends are bringing a dramatic shift in attitudes and ways of working; new behaviours, approaches, and workplace expectations. Whilst many of us are sensing these rapid changes, we aren’t necessarily sure why these changes are happening, what they mean, or how they will impact us. “The disruption of every industry is also causing a bit of unrest as people struggle to define where they fit or if they will be obsolete. It’s forcing us to adapt and change to stay relevant while giving rise to new business models, new products, new companies, new behaviours, and new ways of simply existing in today’s world”. So, the burning questions are: what exactly do these changes look like for employees, managers, and organisations? And, what skills, attitudes, and behaviours do we require to succeed? What we do know is that modern employees are more self-directed, collaborative in their approach, and want to shape and define their own career paths instead of having them predefined for them. They are continually seeking out learning opportunities that fit with their personal purpose and professional aspirations, and are looking for development opportunities that benefit them holistically as a ‘whole person’. They seek the skills, confidence and healthy mind-set to challenge the status quo, to think on their feet, and to continually adapt within highly fluid and ever changing organisational environments. They are looking to learn and develop emotional and social intelligence; to work within increasingly networked communities; to lead, collaborate, innovate and share. Learning to Learn – to be willing to adopt a pro-learning mind-set; to step outside comfort zones, reflect, and make meaning of experiences. Foster genuine commitment and enrolment through shared visions. Provide applied on-the-job challenges and reflection to embed and sustain behavioural changes. This entry was posted in Emotional Intelligence, Engagement, Intelligence, Leadership, Organisational Culture, Personality, Team Building and tagged action, behaviour, behavioural, development, emotional intelligence, engagement, engagement at work on February 2, 2015 by Simon Miller. Game changing for business, life changing for people. If you are a leader in business looking to improve your organisation’s performance you might want to consider improving your capacity to identify, understand and manage emotion, that is, your emotional intelligence. A wide number of research studies over the last decade have shown there’s a direct link between the way people feel and they way people perform in the workplace. For example, research conducted by the Society for Knowledge Economics here in the Australian labour market, found people in high performing workplaces typically feel more proud, valued and optimistic than those in low performing workplaces. Conversely, people in low performing Australian workplaces people typically feel more inadequate, anxious and fearful. Leadership is fundamentally about facilitating performance. Research on emotional intelligence has proven that a leader’s emotional intelligence is key to their capacity to facilitate emotions in employees that drive high employee engagement and performance. 2.The development group, the managers of this group participated in Genos International’s award winning emotional intelligence development program. Development in these areas makes leaders more self-aware, more empathetic, more genuine and trustworthy, more personally resilient, and better at influencing others emotions. Ultimately it helps leaders make their employees feel more valued, cared for, respected, informed, consulted and understood. On average, the emotional intelligence of the sales managers improved by 18 percent. As can be seen in the graph below this helped facilitate, an on average 13% improvement in the Development Group’s sales performance in comparison to the Control Group’s. 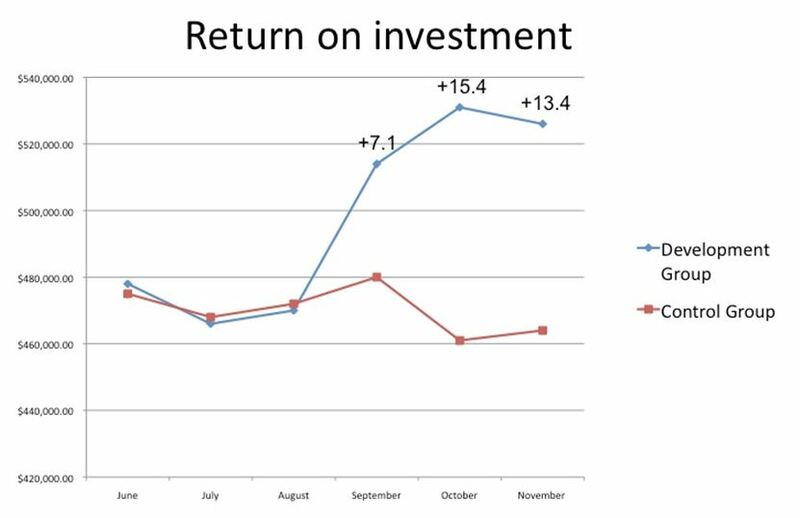 There was a 7.1% improvement in the first month following the program, a 15.4% improvement the month after and 13.4% improvement the month after that (as measured by retail sales revenue by territory). The revenue of the Control Group stayed flat an in the same revenue band during this period. The improvements in revenue generated by the Development Group returned approximately $6 dollars for every $1 Sanofi invested in the program. The findings of the study have been published in a peer-reviewed journal which can be downloaded from the Genos website (http://static.genosinternational.com/pdf/Jennings_Palmer_2007.pdf). Feedback from the participants showed the program not only helped improve the sales performance of reps and their managers. It also helped them improve their relationships with each other. At the time employees were navigating a difficult time within the business as bumps from a merger were ironed out and two different company cultures integrated. As one participant put it “I have seen improvements in behaviour that have increased the bottom line with sales reps. From a management perspective, increased skills that have lead to more buy-in, acceptance, spirit improved, and better communication. However the greatest benefit I received from the program was an improved relationship with my 14yr daughter”. This participant feedback highlights the added benefits of improving your emotional intelligence. Your capacity to identify, understand and manage emotions contributes to your life satisfaction, stress management and the quality of your relationships at home and at work. That’s why developing your emotional intelligence can be game changing for your business, and life changing for you and your people. Stop and reflect on the way you feel in the moment. Take the time to label the feelings you are experiencing and reflect on the way they might be influencing your thinking, behaviour and performance. Become more aware of other characteristics that interplay and indeed cause you to experience emotions such as your personality, values and beliefs. By understanding these you can become better at identifying different emotional triggers and they way you (and others), typically respond to them. This awareness is key to adjusting the way you feel and respond to events. Eat better, sleep more, drink less and exercise (if you aren’t already). Adopt a thinking oriented emotional management strategy, like Edward Debono’s 6 thinking hats, use it when strong emotions arise. Adopt a relationship strategy, someone who’s great at listening and helping facilitate perspective on events. Search the app store, there are some great emotional management apps out there today. For example Stress Doctor, a revolutionary mobile app that helps you reduce your stress level in just 5 minutes via a biofeedback technique to help sync your breathing rate with your autonomous nervous system (ANS). If you would like more information on Enduring Impact Leadership Training please contact auckland@opragroup.com. This entry was posted in Emotional Intelligence, Engagement, Leadership and tagged business, capacity, development, emotional intelligence, Enduring impact, engagement, genos, identify, improve, investment, leader, leadership, OPRA, people, performance, program, research, return, sanofi, staff, swinburne, training on August 9, 2013 by OPRA Psychology Group.